When undercarriages are not cleaned frequently, the lifespan of a vehicle’s engine and battery system can be cut short. When road grime accumulates on the undercarriage of work trucks, buses and new hybrid/electric vehicles, heat builds up and can decrease engine efficiency. That in turn necessitates more frequent washings to keep battery and engine systems cool. 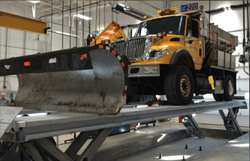 The combination of extreme weather conditions and new engines that tend to run hotter has increased the demand across North America for vehicle lifts that are specifically engineered for wash bay conditions – this according to a new industry overview from Stertil-Koni, the leader in heavy duty vehicle lifts. Here’s what’s fueling the change: “When road grime accumulates on the undercarriage of work trucks, buses and new hybrid/electric vehicles, heat builds up and can decrease engine efficiency. That in turn necessitates more frequent washings to keep battery and engine systems cool and free from mud, salt and other contaminants,” noted Peter Bowers, Stertil-Koni technical sales support manager. Cleanliness is the answer. And, that’s why municipalities, state agencies, corporate fleets, the U.S. Military, school bus fleets, transit agencies and corporate trucking groups are increasingly seeking a solution to keep the undercarriages of their vehicles free of debris. One option that has gained strong recognition and usage is the Stertil-Koni SKYLIFT Wash Bay model. This heavy duty platform lift is water-resistant and features hot-dip galvanized platforms, three-layer mono-pox coated lift supports and a stainless steel, water-resistant, lockable control box to provide superior protection for the electronic controls. The product’s design includes two independent runways, no crossbeams, overhang or base frame and its modular design allows for flush or surface mounted. 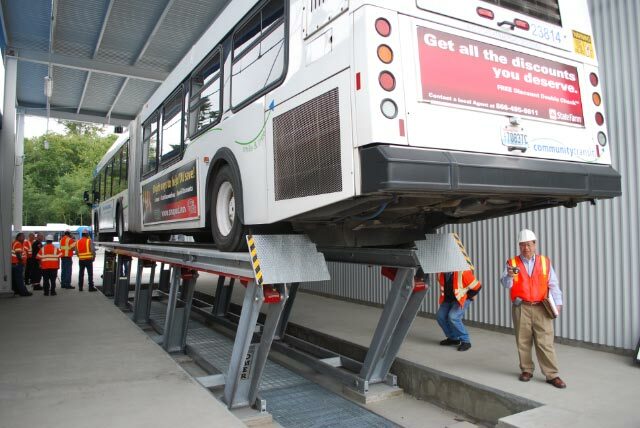 Flush mounting permits heavy duty vehicles with particularly low ground clearance to easily drive directly onto the SKYLIFT, thus facilitating quick and easy access to a vehicle’s undercarriage. The SKYLIFT’s platform lengths are available from 23 feet up to 48 feet and, depending on the model, can lift up to 78,000 lbs. in a standard version or up to 156,000 lbs. in a tandem configuration. Naturally, durability and adaptability are key. Concluded Dr. Jean DellAmore, president of Stertil-Koni, “We pride ourselves in delivering the broadest range of safe, durable, ALI-certified heavy duty vehicle lifting systems for our customers. It’s an approach we call ‘Freedom of Choice’ and illustrates our ability to respond to customer needs with the very best in heavy duty lifting systems to meet their specific requirements. In the instance of ALI-certified, water-resistant vehicle lifts, our customers can rest assured that with the Stertil-Koni Skylift Washbay version, they have a safe, long-lasting solution to ensure that their vehicles can be serviced and cleaned efficiently and safely."